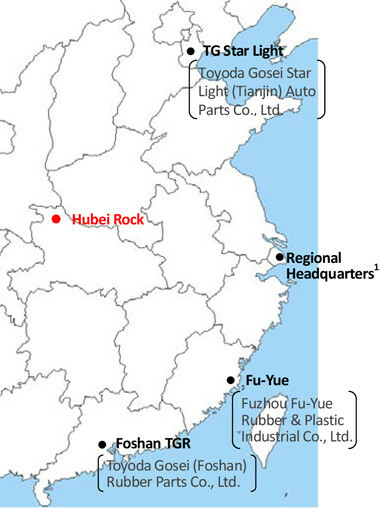 Toyoda Gosei has acquired a majority stake in Hubei Rock Rubber and Seal Technology Co., Ltd. Hubei Rock, located in central China, is an independent supplier that provides weatherstrips mainly to Dongfeng Motor Corporation, one of China’s “Big Three” automakers, and its joint venture companies with Japanese and other foreign manufacturers, including Dongfeng Honda Automobile Co., Ltd. and Dongfeng Peugeot-Citroën Automobile Co., Ltd.
Toyoda Gosei China said it plans to purchase 60 % shares from Hubei Rock’s parent company, Hubei Zhengao Automotive Accessories Co., Ltd., for approximately 800 million yen in December 2018. After the merger the company name will be Hubei Toyoda Gosei Zhengao Rubber and Seal Technology Co., Ltd. Toyoda Gosei said it considers China to be a crucial market, and will continue to strengthen its development and production networks there. Hubei Rock in Central China. 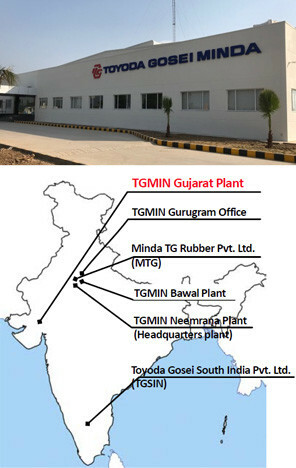 In October 2018 the Gujarat Plant of Toyoda Gosei Minda India Pvt. Ltd. began operations The plant will supply airbags, the demand for which is growing with the increasing automobile production and stricter safety regulations in India, plus supply steering wheels, weatherstrips and other parts to Suzuki Motor Gujarat Pvt. Ltd.
Toyoda Gosei said that India is one of its key markets. It has been enhancing its development and production network there, including the establishment of a new technical and sales office (Gurugram office) in a suburb of Delhi in April 2018. Toyoda Gosei plans to increase its sales volume in India to 35 billion yen by fiscal 2025, more than twice the current level.